Knaresborough Forest emerged triumphant from the battle of Theakston Nidderdale League Division One’s bottom two. Joel Ainsley’s side boosted their own chances of beating the drop when they overcame basement boys Bishop Thornton by a 51-run margin at Union Field. A half-century from Harvey Green (51), plus 32 from Aussie Jayden Harris and Joe Stanley’s 29 helped Forest to 191/7 batting first. Jack Kellett (4-36) and Andrew Hyland (3-54) impressed with the ball for the Curlews, but their batsmen struggled in reply. Opener Rob Nelson struck 36 at the top of the order and Dave Cockshott added 32, however Thornton struggled to deal with some fine bowling by Ben Challis (6-70) and all-rounder Harris (4-45), eventually finding themselves all out for 140 inside 23 overs. Forest are still 23 points adrift of safety despite their win, however Saturday’s opponents are considerably worse off and need a dramatic turnaround in fortunes if they are to retain their top-flight status. There was a dramatic conclusion to the clash between Masham and their visitors West Tanfield, the game eventually finishing as a tie. Nick Virr’s innings of 43 was the highlight of the away team’s 141 all out, Andy Heard scooping 4-51 and Ben Fielding 3-22. Bailey McCourt (41), Brodie Eccles (33) and Jez Smith (32 not out) then guided Masham to the brink of victory, but the match went down to the final delivery and the hosts just missed out, eventually finishing on 141/8. Skipper Angus Shaw was in top form for Tanfield, bagging 5-40. The only other fixture to reach a conclusion in the first division saw second-placed Birstwith get the better of Burton Leonard to move within four points of pole position. James Riley smashed a second century in as many games to help the men from The Moss wrap up a nine-wicket triumph. His innings of 114 not out included 14 fours and four sixes and came from only 88 balls, while Tom Croston also weighed in with an unbeaten 56. Earlier, Burton had made their way to 199/7 thanks largely to the efforts of Toby Drummond (57) and Laurie O’Connor (38). Pete Hardisty was the pick of the Birstwith attack with 3-36. Leaders Helperby saw their advantage at the summit trimmed considerably when bad weather forced the abandonment of their clash at Wath & Melmerby. They ended the afternoon with only seven points to their name, but with their hosts 45/2 chasing just 109 for victory, heavy rain likely saved them from what would have been just a second league loss of 2018. 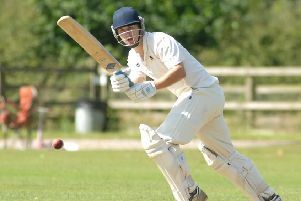 Matthew Nicholls was another player to strike a ton for the second week in succession, hitting 131 as Ouseburn were left frustrated on the road at Goldsborough. Jarrod McPhee (76) and Damon Ive (41) helped the home team put 208/7 on the board and the defending champions needed just 11 more runs from 15 deliveries to complete their chase, only for the heavens to open and force the players off. Elsewhere, Dacre Banks were 64/1 replying to Darley’s 214 all out when the rain came. 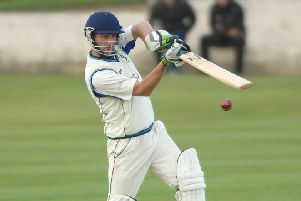 Jordan King had hit 110 for Darley as Salman Sayed grabbed a five-for. In Division Two, Markington are now bottom of the pile after they were beaten for the fifth week in succession, skittled with just 63 runs to their name. Blake Dobbin (4-23) and Ian Morland (3-15) did most of the damage for promotion-chasing Scotton, who had compiled a total of 210/9. Captain Sam Halliday (82) led by example for the visitors, while Markington’s Ed Kellett effected a trio of dismissals. A first innings score of 186/7 saw Spofforth record a 43-run home success over Studley Royal 2nds. James Roberts (44) and Oliver Connew (35) were the main contributors to the hosts’ total, Michael Litterbach helping himself to 4-39. Dan Coad struck 51 in reply, but 3-23 from Matthew Bird ensured that Royal made it no further than 143/8. The rest of the fixtures in the second tier were all abandoned. Raskelf 169-7 (S Porter 51*) v Alne 148-6 - abandoned. Kirk Deighton 129-8 v Blubberhouses 70-4 - abandoned. Killinghall 216-5 (A Thompson 78*) v Burnt Yates 164-9 (D Taylor 58; B MacGregor 6-45) - abandoned. Harrogate Strays 94-8 (T Fryer 5-30) v Pateley Bridge 54-4 - abandoned.